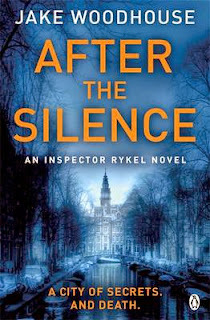 Set in Amsterdam, at the start of this novel, Inspector Jaap Rykel's collegue Andreas is shot and killed. They’d both been working on closing down a gang called 'the Black Tulips', made up of men from a variety of ex-Soviet states who seemed to have taken over the ports, and are controlling the import and export of illegal substances. Jaap is trying to recover after shooting and killing someone, and taking a year of sick-leave, leaving his colleagues slightly wary of him. Jaap is sent to investigate the murder of Friedman, who is found hanging out of a window. Friedman has a connection to the Black Tulips, and may have decided to co-operate with Andreas, but now it's too late. But then Jaap is told about Andreas's death, and has to leave the investigation into Friedman's death to Kees, a coke-snorting, insecure detective. Meanwhile, Tanya van der Mark has been called out to a fire, near Zeedijk, some way outside of Amsterdam, in which two adults had died. She spots a small doll left outside the house, and starts to wonder what happened to the child that must have been in the house with the adults. The fire is suspicious, clearly started deliberately. Using her initiative she asks the local garage for their CCTV tapes, to find out if there were any cars that passed that night, and discovers a car, passing at around the right time. But the driver is wearing a mask and there is a zip where they mouth should have been, a link to the Black Tulips. And then, thrown into the mix is the discovery that Friedman was involved with a charity for abused children. A complex plot, where Jaap has to investigate his friend and colleague's death, and keep a clear head while he discovers facts he’d rather not know about his friend. He uses the I Ching to help set up his mood for the day, a coping mechanism since the shooting that led to his time off. Each morning, he throws the coins and reads the hexagram that gives him sage advice. Tanya is an inventive and intelligent detective that is grudgingly given some free rein to investigate the whereabouts of the missing child, by her superior Bloem, allowing her to go to Amsterdam after she discovers the links between Andreas's investigation and her own. Kees has his own demons, a failing relationship with his wife and an addiction to cocaine that is starting to affect his work and relationships with others. And then there is the background of Amsterdam and the Black Tulip gang. AFTER THE SILENCE is an intriguing read that keeps the momentum going and has an unexpected twist or two that keeps the reader hooked. Got this one to review myself, but thought I'd have a peek at your review - sounds good, and I like the idea of Amsterdam as a setting!